Veqtos led them down a seemingly endless array of tunnels, a veritable maze, while the darkened crystal walls felt as if they were closing in around them. There were numerous more small chambers that opened out off of the corridor, all of which stood empty. Of the others, no sign could be seen after they had found Telata’s body. Nhaqosa felt a growing unease about that, an anxiety to know where they were. He had promised them much, and then led them to this place. If they were dead, well, then that would be too much to bear. “Here,” Veqtos announced suddenly, stepping out of the corridor into a large chamber, much like the one they had first found upon entering the crystal tower. Nhaqosa could see one difference between them though; in the centre there sat a large, square cut block of crystal, crimson in hue, in appearance much like an altar. “Nothing as yet,” Veqtos replied. “Soon, though.” The giant leapt up onto the crystal altar. “Stand back,” he warned. Nhaqosa stepped away from the centre of the room, watching Veqtos. The haze of heat around the burnt giant intensified until it appeared as if an aura of flame billowed around him. A flaming shroud burst forth from his shoulders, shot through with tendrils of flame, like a pair of ephemeral, fiery wings. He went down on one knee, leaning on the hilt of his sword, and started to speak in a language alien to Nhaqosa, chanting out words in a deep and sonorous voice. Another voice answered in kind, coming from out of nowhere and yet everywhere together, impossible to pinpoint, a dark, discordant voice like the scrap of nails across crystal. Nhaqosa could see no one, yet Veqtos answered the speaker, his words ringing through the room. A grinding noise came from the far side of the room as a part of the wall seemed to fold outwards before melding back into itself, leaving behind an open doorway. A figure stumbled into the room through it, dragging a blade behind them. As the figure drew close, Nhaqosa saw that it was Katako, one of his band, but his face showed no expression, being blank, and he walked with erratic movements, juddering as he came. The sword he dragged behind him had a black of dark, smooth polished stone; obsidian. The sword swung up and Katako staggered into something akin to a fighting stance, though his limbs jerked like a puppet on a string. “It is me, Katako,” Nhaqosa told the man. Katako made no reply, or showed any signs he understood. Instead he started a slow advance towards Nhaqosa. “I felt that way too, once,” Veqtos said, and in his words Nhaqosa heard remorse and sadness. The sword slashed clumsily through the air, Nhaqosa stepping back to avoid it with ease, for it came at him with no great speed. It had been Katako’s body that had swung the blade, yet Nhaqosa could see that it had not been his mind behind it. Katako, a trained and experienced gladiator, did not move as one would. Another slashing blow followed, once more Nhaqosa avoiding it with no great trouble, though this one was not as inept as the first. As the fight progressed, Nhaqosa dodging and weaving while Veqtos continued to chant, Katako’s attacks grew steadily more fluid and assured in their swings, as if the one controlling him was learning to master the body it used. Nhaqosa knew that before long one of the blows would connect. He could not avoid them forever. “I am sorry, Katako,” Nhaqosa rumbled as the man raised the obsidian sword, ready to hack down with it. In an instant, Nhaqsa changed his tactics, stepping in quickly. One giant hand gripped Katako’s wrist, halting the downward stroke. A hiss escaped from Katako’s mouth as he struggled to break free of the iron grip that held him, but to no avail; Nhaqosa’s size and strength were too much for him. With his free hand, Nhaqosa began to prise Katako’s fingers from the hilt of the sword. The grip broke and the sword fell free, the obsidian blade ringing like a bell as it struck the ground. “I mean to find that out,” Nhaqosa responded. He looked down where the obsidian sword lay on the ground and his eyes narrowed. Raising a hefty cloven hoof, he brought it crashing down on the blade. The obsidian shattered, shards clattering across the floor. A scream echoed through the chamber in response, a high pitched sound of rage and frustration that stabbed at them, piercing their ears. “You seem to have annoyed it,” Veqtos noted quietly. The chamber echoed with the screams of glass as doorways were wrenched open in the walls. Through them stumbled the rest of Nhaqosa’s band, all unarmed. Strange dark lights started to spiral down from the roof, darting this way and that as they flashed through the air. Then they struck, streaking at each of them with speed that could not be avoided. Pain shot through their bodies as the dark lights struck and the chamber filled with cries and shouts. One by one they collapsed to the floor, bodies convulsing, twitching as the pain wracked them. Only Veqtos remained upright, his chants becoming more strident, spilling from his lips. The dark lights that had struck them erupted from their bodies and with it they experienced the sensation that something had been torn from their souls, an intangible element of themselves that they could not name. Slowly they staggered back to their feet, the lights shimmering as they hung before them. As they watched, the lights began to swell, growing in size. They expanded outwards, taking on a shape and form until before each stood a shadowy replica of themselves, easily recognisable in spite of their translucent nature. Each, though, carried dark shadowy weapons. “Beware!” Veqtos shouted, already too late. The shade that had emerged from a man called Oliat stepped forward and slashed at him. Oliat screamed as the blade flowed through him and blood sprayed forth from a terrible wound across his chest, the insubstantial blade opening him as would a real weapon of steel. Oliat fell backwards to the ground, body shuddering and twitching even as he went on screaming in mortal anguish. One shade, far larger than the others, his own shade, lumbered towards Nhaqosa, swinging a terrible shadow maul. Nhaqosa ducked with the instincts of self preservation and hammered a fist blow into the shade’s midriff, a blow which would have felled a mortal man. It did not feel like hitting flesh, for the shade did not truly have a solid form, though it did have some substance to it. To Nhaqosa it felt like striking thickened mud, his fist sinking partially in. A chill touched his hand, feeling like he had plunged it into a stream of dark, frozen water. A return backhand crashed into Nhaqosa’s head, sending him spinning away, senses reeling and ears ringing from the terrible force of the blow. Only vaguely did he remain aware of the fight going on around him, of shades fighting the living from whom they had been torn. Already bodies lay scattered around the room, too many bodies. Nhaqosa roared with rage to clear his head and charged at his shade. 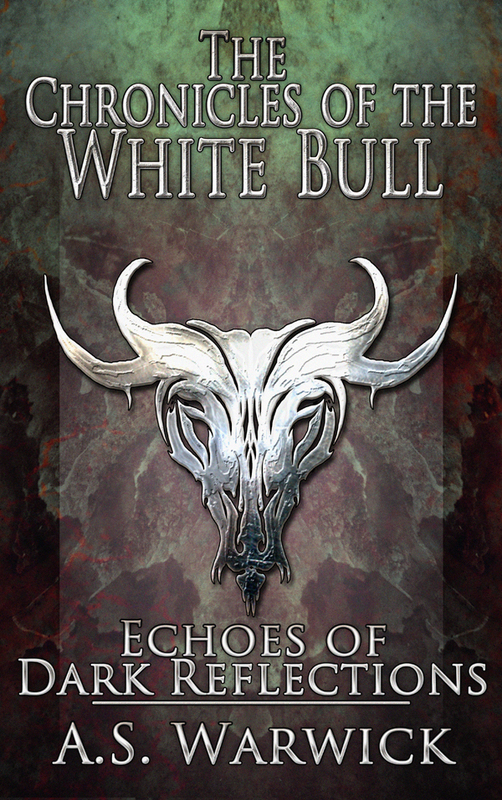 Time and again the blows hammered back and forwards between the pair between the white minotaur and the dark shade. For each one that he landed on the body of the shade, he received back one tenfold. Blood stained his fur, dripping from his battered face. His left eye had swollen shut from one blow and he had lost much feeling in his left arm. Any damage he had inflicted on the shade, he could not make out. In the background he could hear someone weeping piteously in horror and pain. Nhaqosa flung himself to the ground as the burnt giant rose up to his full height where he stood on the altar. The shroud of flames that shimmered around him burst to full life. The fiery tendrils that flowed from his shoulders lashed outwards, whipping at the shades. They jerked as the flames tangled about them and then Veqtos erupted into a ball of searing fire, the flames billowing out across the chamber. Nhaqosa felt the scorching heat pass above him, followed by a scream as someone was caught up in it. As the flames cleared, Nhaqosa saw that the shades were gone, burnt away by a cleansing flame. Veqtos lay slumped over the altar, unmoving, drained by the efforts. Another scream of rage echoed from around them and the darkness that clung to the heights of the roof began to descend, swirling about, spinning in on itself tighter and tighter until a thing stepped out of the darkness. Tall and thin and spindly it stood, with no features to behold. Of the purest dark, it took the shape of a walking, shifting shadow in humanoid form. Nhaqosa charged the shadow, bellowing a challenge. As Nhaqosa neared, it flowed and twisted through the air, dissipating like smoke blown by a wind, shifting aside to reform. Nhaqosa’s blow went wide and provoked an echoing, mocking laughter. The shadowy figure seemed to gesture in the direction of one of the group, to Mirianya, a blonde-haired woman. For a moment nothing happened. Then she sobbed softly, raising shaking hands up to stare at them. “No!” Nhaqosa bellowed, surging forward again. The shadow faded aside once more and then another of the group began to scream at the sight of things only they could see. A shifting of motion caught Nhaqosa’s eye. Veqtos painfully lifted his head from where he lay. “Nhaqosa,” he whispered weakly, his strength almost gone from him. “The blade,” he began, but before he could finish his words, his head fell down again, the fires in his eyes fading. Nhaqosa began to reach for the burnt giant’s sword but paused as his hand started to close around the hilt. Instead he looked around. The broken obsidian sword still lay on the ground, not far away. Leaving Veqtos’ sword, he bounded over to the broken sword. As he reached down and took it up, pain surged through his fingers. He felt them stiffen, locking tight around the hilt. His arm began to shudder as the rigidity spread from his fingers into it, seeping up it. He knew that the sword was slowly crippling him, and that he had only one chance to end it all before that occurred. Once more he bellowed and charged. The shadow turned towards him and, as on previous occasions, flowed aside. Nhaqosa had expected it, counted on it, and at the last moment he swerved in his course, driving the sword forward with the last remnants of his dwindling strength. The broke blade struck, driving deep into the shadow’s chest. Wailing tore through the chamber, tearing at their minds. The shadow thrashed about the blade lodged in its chest, bleeding dark streams of energy that lashed about in the air like ribbons. It began to twist, seeking to escape the blade that pinned it in place, alternating between shirking and expanding, wailing continuously, until it exploded into fragments that dissipated in the air like mists stirred by a wind. Then stillness returned to the chamber.